In my previous blog, I explained the thinking behind Nokia Networks' "Partnering for Growth" strategy and how wider collaboration will sweep away the telco world's old, protective and restrictive practices. An open, collaborative approach will create the extreme innovation needed to keep up with the changing telco and IT landscape. Well, now I want to report on exciting strategic developments on the partnering front. Let’s begin with Apple's iPhone6 and iPhone 6 Plus launches. As well as being one of the sector's biggest launches, the new devices offer Voice over LTE (VoLTE) and Voice over WiFi (VoWiFi). The launch has helped turn these voice services into household names and changed how people discuss the communication service of the future. VoWiFi is particularly interesting as it allows consumers to make voice calls over WiFi networks (both secure and unsecure) from places with poor indoor coverage such as malls, subways or even home basements. It also allows for roaming voice calls to be made at their normal network tariff. These new handsets embed the capability, making it much easier to use than non-native or OTT Voice over IP (VoIP). Expanding VoWiFi to WiFi networks that are not operator controlled means different security considerations. It also means we need to deliver solutions that span across WiFi and 3GPP and strive for an "open ecosystem". Nokia Networks has been actively driving this open ecosystem approach in order to provide operators with the best end-to-end solutions. One of the many elements needed to take advantage of voice over any kind of network with call continuity is an evolved Packet Data Gateway (ePDG), which enables VoLTE-VoWifi interworking, seamless handovers and superior customer experience with guaranteed security. Our recent partnership with GENBAND allows us to embed their ePDG into our Liquid Core to support multimedia voice, data and video sessions and anywhere/any-device services. The combination of Nokia Networks' IMS/VoLTE's reliable interworking with VoWiFi and GENBAND's ePDG means operators can immediately satisfy their customer's desire to try out their devices' new VoWiFi/VoLTE capabilities. Another example of collaboration in action is our recent agreement with Flash Networks to include the company's Harmony™ Gateway as part of our mobile broadband core. Operators can optimize video and web traffic for an improved user experience, enable faster web browsing and downloads, smoother video viewing, and content control services with Harmony Gateway. The partnership creates a significant value-add and enables operators to stay competitive with the fastest network possible, while handling unbridled mobile data growth. And this without compromising the mobile broadband quality we in Nokia Networks are known for. In the fast-developing world of telco cloud, Nokia Networks is working with Red Hat to bundle our carrier-grade virtualized core applications and cloud application management products with Red Hat Enterprise Linux OpenStack Platform. The partnership accelerates developments in OpenStack based cloud environments and helps bring new services to market rapidly. Operators can more flexibly deploy capacity to meet traffic needs and better serve customers. And fresh off the press is our collaboration with HP to develop an integrated solution enabling our virtualized network functions (VNFs) to run on a cloud infrastructure layer that integrates HP data center hardware, hypervisor and virtual infrastructure manager, based on HP Helion OpenStack® technology. Nokia Networks is also engaged in much wider collaboration in cloud technologies with the Open Platform for Network Functions Virtualization Project (OPNFV). OPNFV will be a carrier-grade, integrated, open source reference platform to accelerate the introduction of new products and services. The Open Platform for NFV will bring together providers, cloud and infrastructure vendors, developers and users alike to define a new reference platform for the industry. Nokia is a founding member, along with operators like AT&T, China Mobile and Vodafone, as well as other leading industry players who are pushing together to achieve a working platform. It’s been just a few weeks since my previous blog and already we can see how the theory is being put into practice to deliver better customer experiences in so many ways. Together with our chosen partners, we believe we have a powerful role to play in what we call the Programmable World, where everything and everybody can be connected. Expect to see much more on this in the near future. 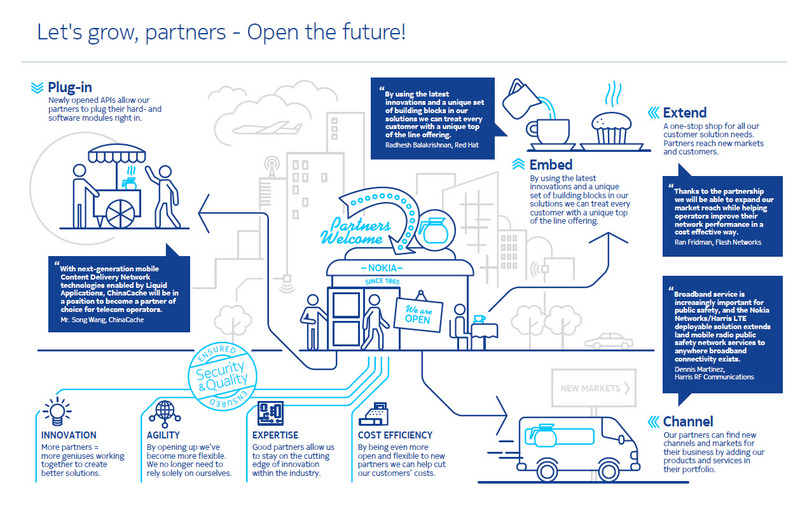 We have more to share on Partnering at Nokia here. Share your thoughts on this topic by replying below – or join the Twitter discussion with @nokianetworks using #NetworksPerform #mobilebroadband #Nokia #NetworksPerform #VoWifi #VoLTE #innovation #GENBAND.